This post is sponsored by RiceSelect. All content and opinions are entirely my own. Creamy Lemon Chicken and Rice is an easy recipe that works perfectly for busy weeknights, yet is impressive enough for entertaining guests as well! This recipe uses simple ingredients that result in an amazingly, flavorful dish. 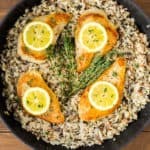 This recipe for Creamy Lemon Chicken and Rice was inspired by a similar recipe that I shared recently of a low carb version. I realize that not everyone eats the same and that quite a lot of people don’t love cauliflower as much as I do. I don’t typically turn my low carb recipes into “normal” recipes, but this one is so, so good that I just had to! I don’t want anyone missing out because *gasp* cauliflower might be involved! Nope guys, this recipe is all about the creamy, lemony, rice! 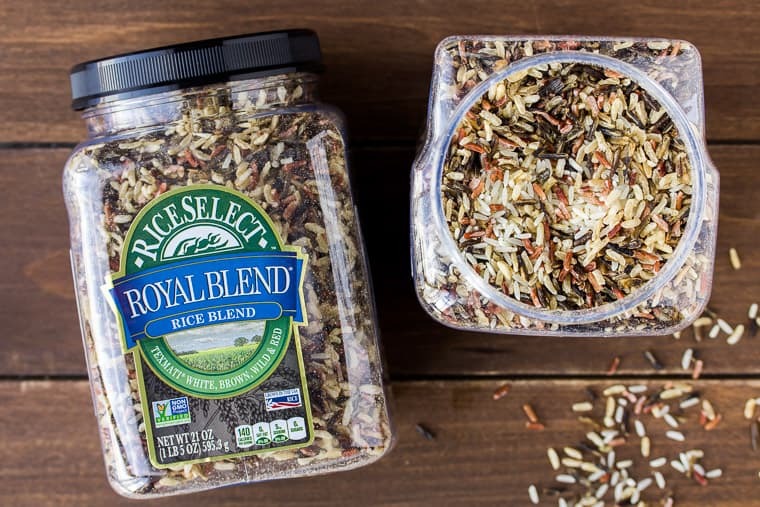 I use only the best rice for this recipe – RiceSelect Royal Blend . It’s a combination of Texmati White, Brown, Wild, and Red rice. Not only does it taste great, but it really makes the dish even more beautiful. I’ve been using RiceSelect for as long as I can remember. You can tell just from looking through the clear jar, it’s a high-quality rice that’s easy to incorporate into a variety of recipes and dishes. I also recently learned that RiceSelect rice is a natural, clean food. There are no preservatives, chemicals, or added substances and they are non-GMO verified. You can find RiceSelect in many grocery stores as well as online HERE. This is an easy-to-make family-friendly meal that is perfect for busy weeknights. It’s a beautiful dish that tastes amazing, making it a great choice for entertaining guests, as well! The combination of lemon and thyme tastes great together especially within the creamy sauce. Prepare the rice according to the directions on the package. 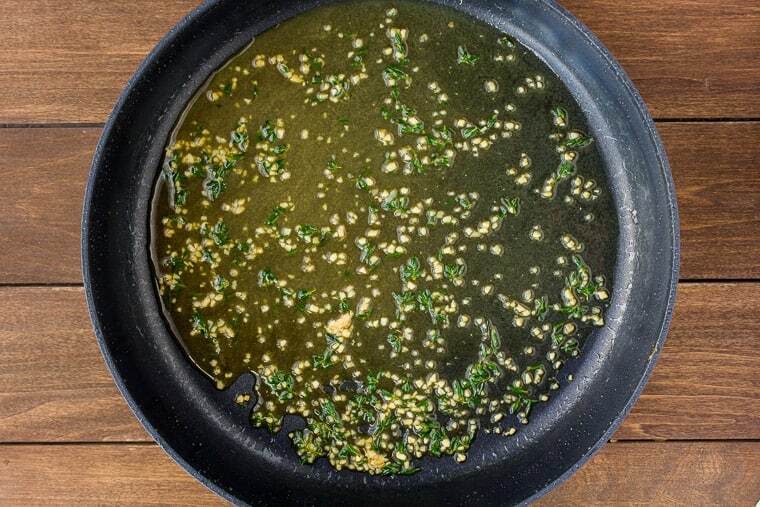 Strip the leave from the thyme until you have 1 tablespoon and juice the lemon. Tip: while you can make this a one pan meal by preparing the rice in the same skillet, after removing the chicken, I have found that cooking the rice while prepping the other ingredients and searing the chicken actually saves time. Place the chicken into the hot skillet and cook on one side until golden brown, about 3-5 minutes. Flip the chicken and cook about 2-4 minutes, or until cooked through. Remove the chicken to a plate and tent with foil to keep warm. Add the chicken stock, garlic and thyme to the skillet and stir, scraping up any bits from the bottom of the pan. Continue to simmer until the liquid is reduced by half, about 2-3 minutes. 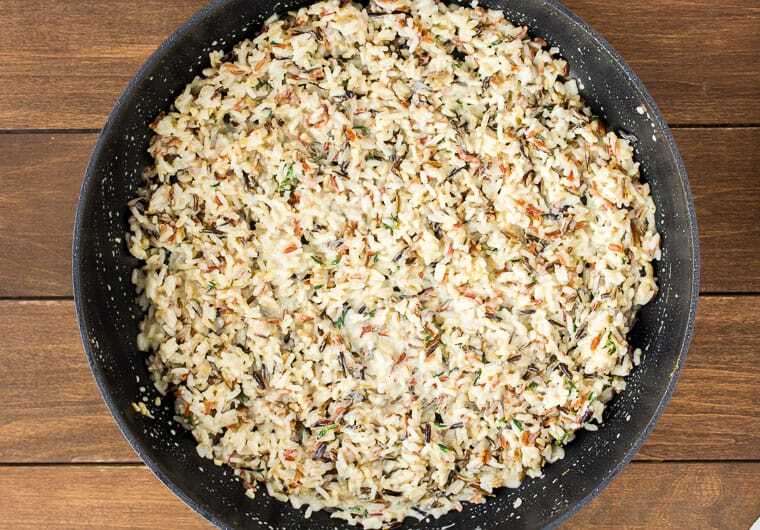 Remove the skillet from the heat and stir in the rice, heavy cream and lemon juice. Add the chicken back to the pan, garnish with slices of lemon and additional fresh thyme. 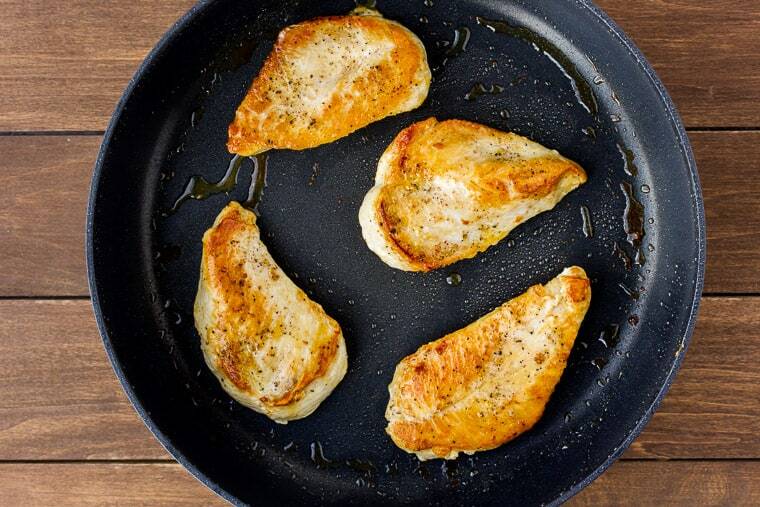 If you can’t find thin cut chicken breasts, you can pound out regular chicken breasts to about 1/2-inch thickness before cooking. If you need to substitute dried thyme for fresh thyme, use only 1/2 tablespoon. You can turn this into a one pan Creamy Lemon Chicken and Rice recipe, however, I have found that it saves time to prepare the rice while prepping the other ingredients and cooking the chicken. Store any leftover Creamy Lemon Chicken and Rice in the refrigerator and use within 3-4 days. Can you use milk in place of the heavy cream? Yes, you can substitute milk for the heavy cream. The sauce may not be quite as creamy but should still taste just as delicious. Do you have to use fresh lemon juice? No, you can use bottled lemon juice. I find that fresh lemon juice tastes better in recipes, but you can use whatever you have on hand. 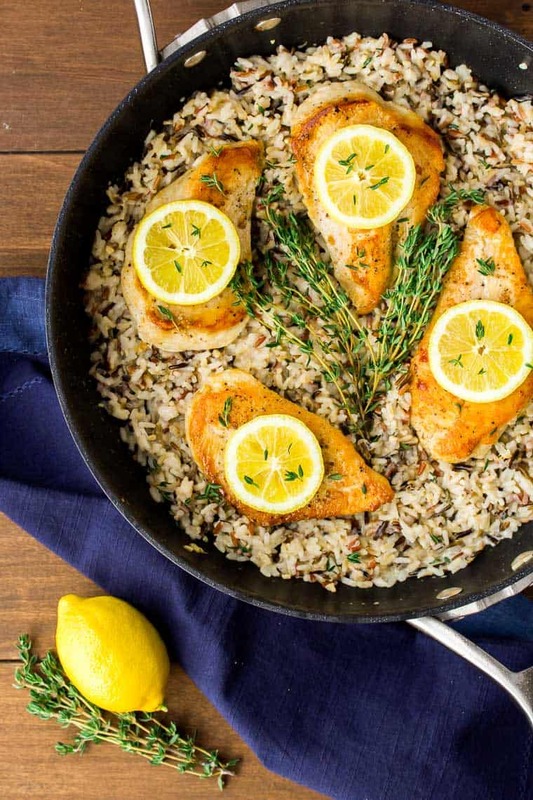 Love this Creamy Lemon Chicken and Rice recipe? Follow me on Pinterest, Instagram, and Facebook for more! 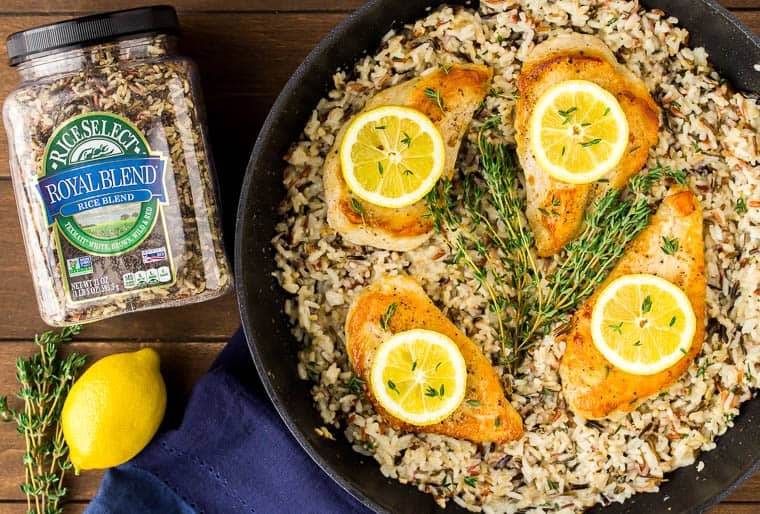 Creamy Lemon Chicken and Rice is an easy recipe that works perfectly for busy weeknights, yet is impressive enough for entertaining guests as well! Prepare the rice according to the directions on the package. While the rice is cooking, season the chicken with salt and pepper. Add chicken back to the pan, garnish with slices of lemon and additional fresh thyme. I love one pot meals! This looks so amazing! But can we talk about that rice? I love that it’s a combo of different rices! YUM! This dish sounds delicious. I love creamy dishes with lemon and that mixed rice looks good! I’m not sure I can find it here in Italy but I’ll keep an eye out for it! Lemon chicken is such a tasty dish, the flavours go so well together. I love your choice of rice, a lovely blend of grains that gives delicious flavours and textures. This creamy lemon chicken rice looks delicious. I never liked the chicken and rice growing up and now I know why. It was missing all the wonderful flavors from the spices and lemon.